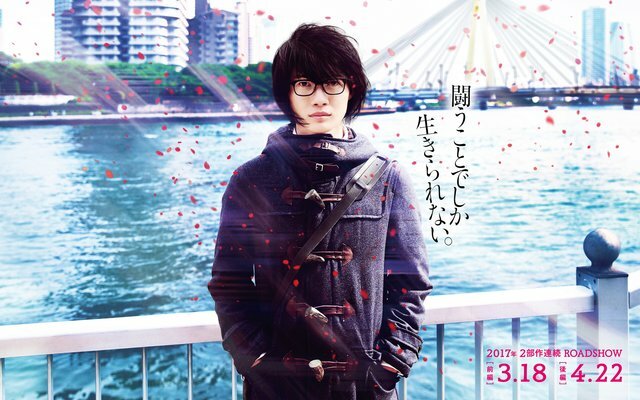 Trailer for upcoming Japanese film "March Comes in like a Lion"
Rei Kiriyama is a 17-years-old shogi (Japanese chess) player. He debuted as a professional shogi player when he was in middle school. He lives by himself in Tokyo, because his parents and younger sister died in an traffic accident when he was little. One day, Rei Kiriyama meets three sisters who are his neighbors. The three sisters are Akari Kawamoto, Hinata Kawamoto and Momo Kawamoto. This is his first meeting with someone outside of the shogi world in many years. Having meals with the Kawamoto family brings warm feelings to Rei Kiriyama. As Rei Kiriyama continues his shogi career, his interactions with his neighbors allows him to grow as a shogi player and as a person. "March Comes in like a Lion" is based on the manga series "San gatsu no Lion" by Chica Umino (first published July 13, 2007 in Japanse seinen manga magazine Young Animal). It is split into two Part 1 and Part 2. Director Keishi Ohtomo is well-known for his Rurouni Kenshin movies. Asian Film Vault: Trailer for upcoming Japanese film "March Comes in like a Lion"